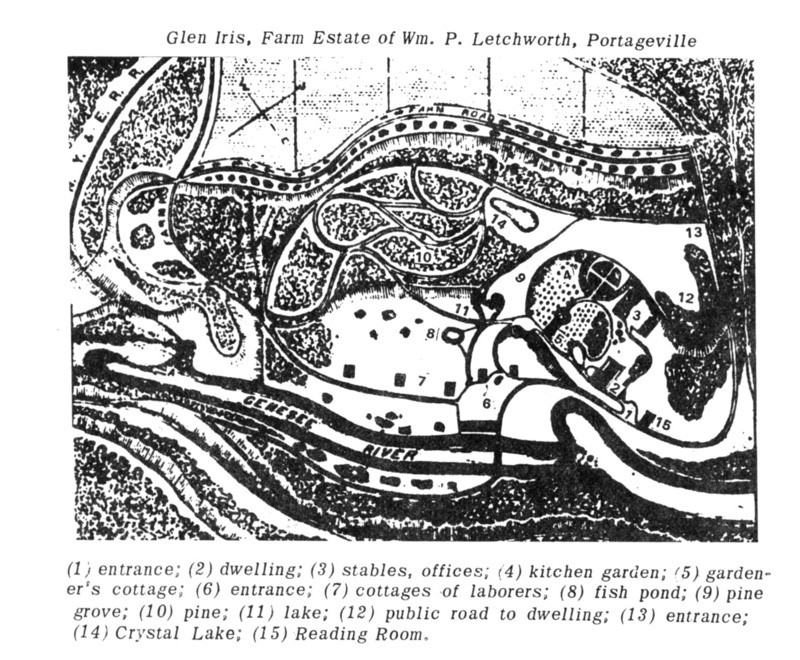 The following article is the earliest and perhaps the best description of Letchworth's Glen Iris Estate. It was originally published in Moore's Rural New Yorker on March 16, 1861. The article was submitted by William Webster, the landscape architect that Mr. Letchworth hired to set up his new estate. This copy, along with the map comes from Barnes p 7. The Map which accompanied the article is found at the end. "We have in this country but few rural residences - such as would be called in Europe country seats-all laid out in parks, lawns, and gardens, for beauty and pleasure, such as is very common in England, and which gives such a pleasant variety to its scenery. We do not regret that this is so; for where we find a few sufficiently wealthy thus to gratify their taste, we find many poorer. Here wealth is divided among the people, few amassing a very large amount, and few fail to obtain sufficient to gratify all reasonable wants. But where persons have, by industry or ability, or good luck, accumulated a large fortune, we are pleased to see them expend a portion in the cultivation of the beautiful trees and plants which the Creator has placed here for our enjoyment-in showing how nature and art combined can make a copy, imperfect thought it be, of the first and best of all gardens, where grew every tree that was pleasant to the sight and good for food. Such establishments serve as lighthouse, to guide the masses in work of improvements. "Last season we received an invitation to visit the country seat of Wm. P Letchworth, Esq., on the Genesee River, near the village of Portageville, and in full view of Portage Falls, the High Bridge, and the romantic scenery which has given that section of the State a world-wide fame, and made it a favorite resort of the tourist. Mr. L's farm consists of about two hundred acres, already partially improved by the construction of walks and drives through the forest, lawns, seats, rustic adornments, while other improvements are contemplated an in progress. Not finding it convenient to accept the invitation, we have been furnished by William Webster, who had charge of the improvements last seasons, with a drawing of the grounds and a few pages from a new work on Landscape Gardening, which he designs publishing, descriptive of this place." "Glen Iris, the country seat of Wm. P. Letchworth, Esq., is situated on the Genesee River, near Portageville, and contains about two hundred acres, finely diversified with rock, wood, and water, the scenery is picturesque and grand, and the natural advantages and capabilities of the place are well appreciate by the proprietor, and none of its natural beauties have been marred but rather improved by art. In formulating my designs, and in the execution of the work so far completed, I have strictly adhered to the natural style, and my views in all respect have been in accordance with those of the proprietor. In ground operations no leveling has been attempted, except to overcome some steep ascent in the drive, or to remove some slight obstructions on the surface. The fences, gates, bridges, etc. are all executed in rustic style"
"By reference to the plan, it will be observed that there are three entrances to the estate, marked respectively 1, 6, 13. The principal entrance is at 1. The dwelling is located at 2, and the stables and offices at 3. Here is seen one of the difficulties I have already hinted at as likely to occur in places that have been previously occupied. In this case the dwelling was located in too close proximity to the entrance gate, there by destroying the good effects which might have been obtained and the arrangement been otherwise. But as the dwelling, stables and offices had undergone a thorough repairing, there was no alternative but to let them remain for the present. The small space encircled by rays formed a terrace of about ten or twelve acres in extent. On this is located the dwelling, stable, offices, gardener's cottage, and kitchen garden at 4, and orchard. The most natural site for the dwelling would have been near the place where the gardener's cottage is located and which is marked 5 on the plan. This arrangement would have presented a broad and ample lawn between the entrance and the dwelling from the front part of the house. As now represented, the drive is carried along near the edge of the terrace, past the gardener's cottage to a point where it is intersected by another drive, from the lower entrance which winds around the hill to the point of intersection. From this point, for a short distance, the drive is supported by a retaining wall and hand rail. From thence it sweeps around to the foot of a small lake, marked 11, across which is thrown a neat rustic bridge. A little beyond this, and to the left of the drive, is a small fish pond, marked 8 which is fed by a never failing spring of purest water. From this point the drive ascends the hillside to the higher grounds beyond where it is intercepted by numerous other roads. These are made to traverse the hillside in every direction, sometimes through ravines, around knolls, over streams, through woodland and glade, diverging frequently where some giant oak or pine would seem to bar it further progress, plunging at times into the deep and gloomy forest and at others opening out into a beautiful stretch of verdant lawn." "It may be well to mention that a great portion of the estate through which these roads pass, is original forest, and having been but lightly thinned, the trees have attained, many of them, enormous growth. There is one in particular, a noble pine, a round which one of the drives is carried and which is marked 10 on the map, that is well worthy of native, rising as it does from the center of the road with a majestic and stately shaft to the height of nearly one hundred and fifty feet and which for a long distances is clean and straight as an arrow. The tulip trees and magnolias are conspicuous objects in these grounds. Indeed it is seldom that I have found so large a number of species and varieties of our native trees in such as circumscribed space. For those who are desirous of extending their ride to a more remote part of the grounds, the drive is made to connect with the Farm Road, which is carried along the upper edge of the bluff, the elevation of which is three hundred feet above the bed of the river between the Upper and Middle Falls and from which an extended view of the surrounding country can be obtained. One side of the road is flanked by a stump fence, which is quite characterizing of this part of the country. The main drive which is about a hundred feet below this, after following the course of the bank for some distance, approaches and passes close to a small but beautiful sheet of water called Crystal Lake marked 14 on the plan. The drive in passing the lake immediately emerges into a most beautiful stretch of verdant lawn, to the right of which is a beautiful pine grove marked 9, which contains a number of rustic seats and from thence is carried a short distance along a side hill, until it finally issues out into the public road through the upper entrance gate marked 13." "Opposite the bridge which crosses the river at Middle Falls is the lower entrance gate, on one side of which is the porter's lodge, on the other cottages for the laborers marked 7 employed on the estate. The main approach to the dwelling from the railroad station is by the public road on the north as seen on the plan near to the short curve which winds around the point marked 12. A little to the northeast of the main entrance are the Middle Falls stairs which lead to the bed of the river. By the side of the stairs descends one of the most charming cataracts to be found, being the overflow of the small creek shown on the northeast corner of the map. This is a great point of attraction for the tourist. A small building for the accommodation of visitors is placed at the head of the stairs, where those who feel disposed can enter and rest themselves after the fatigue of ascending the river bank. Close to and on the right of the main entrance is a good sized building marked 15. This, Mr. Letchworth, with his accustomed liberality, has furnished with a large number of the leading periodicals and public journals of the day, and thrown open to the public free of charge as a reading room. Among the other improvements which my plan embraces and which will be entered into as soon as practicable, is a rustic veranda for the reading room and also one for the reading room at the middle falls stairs." "That this place and its sublime scenery is not wholly unknown abroad, I can vouch for, as I have in my possession a large photograph of the immense bridge and the scenery surrounding who came purposely to this country, a short time since, to take among other places, some of the best views in the vicinity of Portage." Please note: The above map is a scan from Mrs. Barnes' book. Click here to see an enlarged copy of the map from another source. You will have to use your back button to return to this page.